Back in April I slipped out one evening and had the pleasure of spending a couple of hours with a barefoot blonde Brazilian woman. Afterward as I drove home I felt a sense of inadequacy as well as being incredibly impressed with the experiences that had been shared. Don’t worry, I’m not about to use a guest post on 10,000 Birds to make a full and frank confession and beg anyone’s forgiveness. My meeting that evening with Dr Christine Bernado had been arranged so that I could hear about her work monitoring re-introduced Red-billed Curassows Crax blumenbachii into the lowland Atlantic Rainforest of Brazil. My sense of inadequacy derived from comparing my own rather limited conservation efforts, with the work that Christine has been involved in. 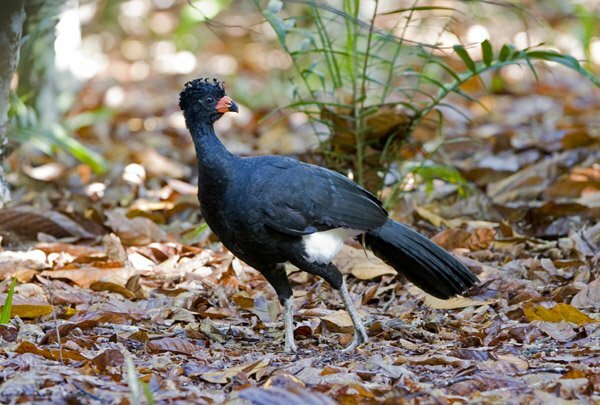 The Red-billed Curassow is a cracid endemic to the Atlantic lowland forests that historically stretched from what is now the sprawling city of Rio de Janeiro north to southern Bahia. The forests that were once occupied by Red-billed Curassows have declined dramatically during the last century as more and more of them have been cleared for agriculture and pastures: from an estimated size of 1.35 million km², the Brazilian Atlantic Forest had been reduced to just 7.3% of its original size by 2005. Hunting, both for sport and subsistence, has also played a key part in the species decline. Curassows are particularly susceptible to hunting as a result of their behaviour when alarmed; they fly vertically up to a perch 3-4m above the ground and proceed to then ‘assess’ the threat with obvious consequences if they are being hunted. Birdlife International and IUCN consider Red-billed Curassow to be globally Endangered, as it has a greatly fragmented distribution and has declined continuously in its extent of occurrence. Wild populations of Red-billed Curassow are now known from only eight localities, all protected by the government or private institutions. There are several populations of re-introduced birds. One of these is at Reserva Ecológica De Guapiaçu (REGUA) where Dr Bernardo has been working since 2006. REGUA came into being in 2001 and has key financial support from the UK-based charity ‘Brazil & Atlantic Forest Trust’ (BART) which has also played a key part in financing the four year project to re-introduce and monitor the Red-billed Curassow. REGUA’s altitudinal range and variety of habitats ensures a huge diversity of birds. 451 species have been confirmed at REGUA, including 61 Brazilian endemics and 117 Atlantic Forest endemics – more bird species than at any other site in the Atlantic Forest. 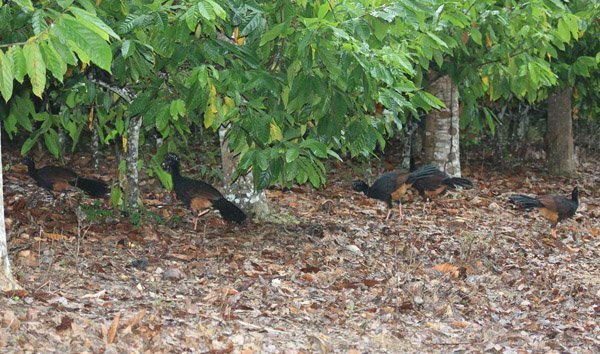 The Red-billed Curassow Reintroduction Project at REGUA is a joint venture between REGUA and CRAX Brasil, the breeding centre for the re-introduced individuals. Since August 2006, about 48 individuals have been reintroduced at REGUA. Christine has spent much of the last 3½ years since the first releases living alone without access to many of the modern appliances that most of us take for granted such as TV and telephone. When I asked how she had coped with the apparent isolation, she shrugged her slim shoulders and smiled, saying that the telephone and a conversation with family was “only a short bike ride away through the forest”. Her dedication and work has provided new information about the behaviors and habitat preferences of Red-billed Curassows and information that will prove useful in other Curassow conservation projects. One of the key findings was the species tendency to stay close to water sources such as streams and rivers. This will influence site selection in future re-introductions. It also provided insights into how and when the species establishes pair bonds in the wild, highlighting the tendency for young birds to stay together in loose groups prior to pairs being established (it takes Red-billed Curassow 30 months to reach adulthood). Tracking the releases also yielded useful information on the habitat selections and preferences of the released birds. One surprise was their occasional appearance in the crops of local farms, highlighting the importance of working with local people on boundaries. The project was not without losses, highlighting the continued fragility of the species: four individuals were believed to have been killed by hunting and five died during the release phase in the release pens. Further losses were attributed to ‘natural’ predation from large cats such as the Puma and also domestic dogs. The re-introduction of any species is a long, slow and complex process and Red-billed Curassow is certainly no exception, but hopefully Christine’s four years in the forest will provide firm foundations for the future success of continued attempts to re-build the population of this impressive species. I know that just listening to the unassuming, quiet voice of Christine Bernardo not only left me impressed with her dedication and commitment, it provided a shot of inspiration to try and do more when it comes to conservation. Many thanks to Laura Owens at the World Pheasant Association for sourcing the superb images which accompany this article. It’s great that they are able to reintroduce this species and track their progress! I hope their also working on protecting their habitat. Wonderful article. The work that REGUA is doing in the Atlantic lowland forests is exceptional. Great article and great work. 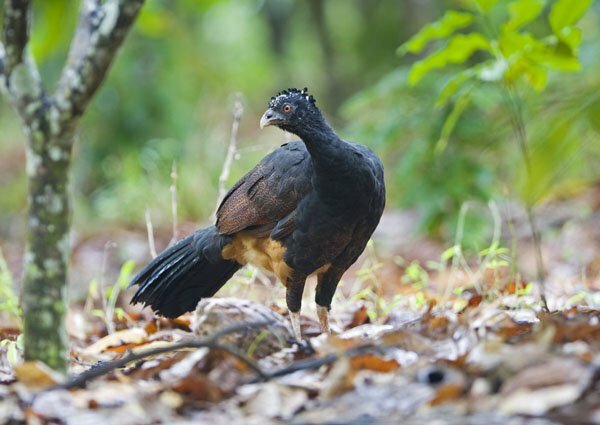 I was looking at the bird guide in Ecuador and we show the Wattled Curassow, which is almost identical, and we have had no recent records of any sighting. The Bird Life data zone indicates and estimate of 250 to 999 individuals; almost extinct! This is a beautiful bird and thanks for the work of REGUA I hope to see it some day.